Even if you hate to admit it, the older a floor gets, the more problematic it becomes as normal wear and tear becomes apparent. As time goes by, the floors no longer look or function the same way as before. Fortunately, Hartnett Flooring can help you fix all types of flooring problems. Hardwood floors are known to be durable and long lasting. However, wood flooring is still subject to wear and tear, particularly in areas that are damp, water-prone, unstable and shifting buildings and footings or if not installed properly. If you have noticeable blemishes and spots in your floor or you keep on hearing squeaks while you walk over it, then call us for our free, high quality wood floor repairs advice. Being in the flooring industry for over two decades, we have encountered all types of flooring problems. From structural damage to surface damage, we have seen and fixed it all. Using hardwood floors can come with many types of problems, but we have the solutions to remedy them all. 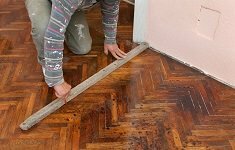 Our Melbourne wood floor repair technicians know just what to do, what products to use, what techniques to implement and what types of repair services you need to restore your old flooring. If you think your wooden floor could use some repairs, we are here to help. We offer a wide array of floor repair services including sanding, re-sealing, re-staining, plank and board replacement as well as filling gouges and holes of all sizes. No wood floor problem is too difficult for us to handle. Whether it is squeaks, blemishes, has spots or marks, we can repair it for you! Do not hesitate to call us now. Our flooring experts are here to provide you with a no-cost, obligation-free, on-site estimate along with a free consultation.